Plant a tree in memory of Angeline "Angie"
Be the first to share your favorite memory, photo or story of Angeline "Angie". This memorial page is dedicated for family, friends and future generations to celebrate the life of their loved one. 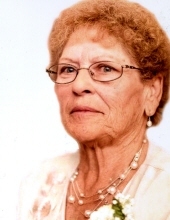 Angeline M “Angie” Solgat, 81, of Quanicassee, died Saturday, March 23, 2019 at Covenant HealthCare Harrison Campus in Saginaw. She was born September 25, 1937 in Saginaw, daughter of the late Arthur F. and Angeline (D’alla) DuRussel. Angie was a 1955 graduate of Reese High School. On August 10, 1957 she married the “ love of her life” Eugene Solgat Sr. in the St. Norbert Catholic Church in Munger. He survives her. Together they raised eight children. She was a member of the St. Elizabeth Catholic Church in Reese. Angie was a homemaker most of her life and enjoyed being with her family, especially her grandchildren. Her other likes included fishing, canning, watching the MSU Spartan’s sporting events, gardening, and raising flowers. She had a very strong willed personality, and was known for not giving or taking any gruff. Surviving in addition to her husband Gene, are her children and their spouses; Nancy and Steve Schaub, Eugene and Becky Solgat Jr., John and Beth Solgat, Mary and Mark Kern, Judy and Steve Toyzan, Pam and Bill Matthews, and Dennis and Michelle Solgat, twenty-five grandchildren, thirty-nine great grandchildren, and her daughter-in-law, Susan Solgat. Also surviving are her brothers and sisters; Lois Szekely, Arthur (Florine) DuRussel, Dale DuRussel, Floyd “Chub” (Mary) DuRussel, Nancy (Ward) Swartz, Ben (Sue) DuRussel, her brother-in-law; Jim Karp, and her sister-in-law Marjorie Whitney. In addition to her parents, Angie was predeceased by her son, Gerald “Jerry” Solgat, twin granddaughters, Stephanie Jean and Tiffany Rose Solgat, and her grandson, Matthew John Solgat, four sisters; Ruth DuRussel, Mary Ann Gravlin, Evelyn Beyerlein, Rose Karp and one brother, Robert DuRussel. The Funeral Liturgy will take place at 11 a.m. Friday, March 29, 2019 from the St. Elizabeth Catholic Church in Reese. Father Joseph Schabel will officiate with the Rite of Committal to follow in the St. Elizabeth Catholic Cemetery. Angie’s family will receive friends at the Ware-Smith-Woolever Funeral Home, 9940 Saginaw St. in Reese on Thursday from 2-8 p.m. and at the church on Friday from 10 a.m. until the time of the Liturgy. Those planning and expression of sympathy are asked to consider memorials in her name to her family. To plant a tree in memory of Angeline "Angie" M. Solgat, please visit our Tribute Store. "Email Address" would like to share the life celebration of Angeline "Angie" M. Solgat. Click on the "link" to go to share a favorite memory or leave a condolence message for the family.